The Raving Queen: Wait Till You Hear This, Darlings!!!!!!!!!!!!!!!!!!!!!!!!! Wait Till You Hear This, Darlings!!!!!!!!!!!!!!!!!!!!!!!!! Girls, have you seen this week's "Back Stage?" On the cover is the title--"Death Of The Chorus," signifying changes on the Broadway stage for performers. 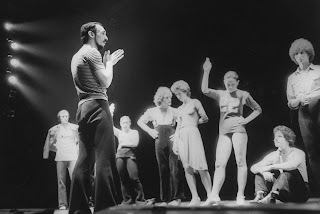 It seems that being a triple threat talent--which the one, the only, original "A Chorus Line" helped define--is now passe. In addition to all that, you have to be athletic, because, more and more gymnastics are being worked into Broadway choreography. This is Hell, especially for future young performers. Back in the day, when we were young, and being athletic seemed to matter a lot, it was comforting for some to know there was a place--the theater, the Musical Theater--where not being such was OK. It forms part of Bobby's monologue in "A Chorus Line," and it is a subtext to "At The Ballet." But, NOW, oh my God, is it going to be "Everything was beautiful......at the gym???????" Just does not have the same resonance! So, now, dance skills are not enough! You have to be an athlete!!!!!!!!!! Wonder what Michael Bennett, Jerome Robbins and Bob Fosse would say about that?????? Hell, I wonder what the "Chorus Line" originals would say about it????????????????? The Theater has always been called "The Fabulous Invalid!" But this is what might put it in traction!!!!!!!!!!!!!!!!!!!!!!!!!! Nowadays, when those in the performing arts say "Break a leg! ", it becomes more probable than ever!!!!!!!!!!!!!!!! And "Screw you!" Diane Paulus!!!!!!!!!!!!!!!!!!!!!!!!!!!!! !